Figure 20.8. 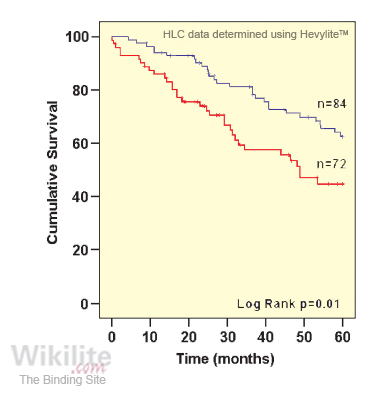 Overall survival of MM patients stratified by HLC ratio at baseline. Median survival was 40.5 months in patients with a highly abnormal HLC ratio at baseline (<0.022 or >45; red line) and was not reached in patients with a less abnormal ratio (blue line; p=0.016). (Reprinted by permission from Macmillan Publishers Ltd: Leukemia , copyright 2013). Figure 20.9. 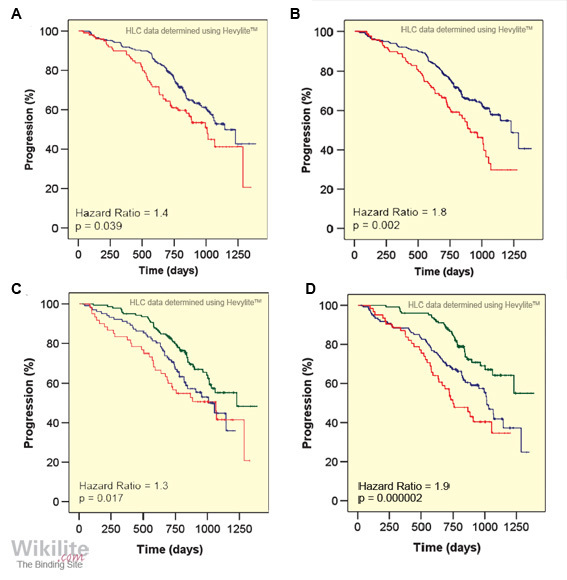 Progression-free survival of MM patients stratified by HLC ratio at baseline. (A) HLC ratios above (red, n=163) or below (blue, n=162) median values. (B) Extreme HLC ratios (<0.01 or >200, red, n=116) or less extreme values (>0.01 to <200, blue, n=209). (C) Relationship between baseline IgG HLC ratios and progression in IgG MM patients. (Reprinted by permission from Macmillan Publishers Ltd: Leukemia  copyright 2013). Figure 20.10. Progression-free survival of MM patients stratified by (A) involved HLC concentrations at baseline, (B) uninvolved HLC concentrations at baseline, (C) the ISS, and (D) β2-microglobulin (β2M) and HLC ratios. Patients in (A) and (B) grouped as upper 1/3rd (red, n=116) or lower 2/3rds (blue, n=209). (C) ISS Stage I (green, n=140), Stage II (blue, n=102), Stage III (red, n=60). (D) Low risk: β2M <3.5 mg/L and HLC ratio 0.01 - 200 (green, n=124), intermediate risk: either β2M >3.5 mg/L or HLC ratio <0.01 or >200 (blue, n=122), high risk: β2M >3.5 mg/L and HLC ratio <0.01 or >100 (red, n=62). (Reprinted by permission from Macmillan Publishers Ltd: Leukemia copyright 2013). Recent studies have assessed the relationship between HLC ratios and outcome in MM, both at presentation and at maximum response. Ludwig et al. investigated the prognostic value of baseline HLC measurements in 156 patients with IgG or IgA MM. The median survival of the entire cohort was 53.5 months. Extreme HLC ratios (<0.022 or >45) at presentation were significantly associated with shorter overall survival (OS) times (hazard ratio [HR] 2.07, 95% confidence interval [CI] 1.15-3.75; p=0.016) (Figure 20.8) . Similar findings were reported by Suehara et al. using a HLC ratio cut-off of <0.01 or >100 and Garcia de Veas Silva et al. using an involved HLC (iHLC)/uninvolved HLC (uHLC) ratio cut-off of >80. Bradwell et al. studied the prognostic value of baseline HLC ratios in 339 MM patients comprising 245 with IgG (166 IgGκ, 79 IgGλ) and 94 with IgA (60 IgAκ, 34 IgAλ). During the study period, 125 patients (37%) had disease progression and 46 patients (14%) died. When patients were grouped according to baseline monoclonal protein concentrations determined by SPE (grouped according to either above/below median values or by tertiles of concentration), no significant differences in progression-free survival (PFS) or OS were observed. By contrast, there was a significant correlation between HLC ratios and outcome. When patients were categorised with iHLC/uHLC ratios above/below median values, a significant difference in PFS was observed (p=0.022; Figure 20.9A). This significance increased when patients were grouped according to extreme HLC ratios (<0.01 or >200 compared to 0.01 - 200). Approximately one-third of the patients had extreme HLC ratios, which were associated with significantly shorter PFS (HR 1.9, p=0.0002; Figure 20.9). Similar findings were reported by Lopez-Anglada et al. . Bradwell et al. noted that whilst there was a tendency for patients with extreme ratios at baseline to have shorter overall survival, this did not reach significance. Bradwell et al. also analysed IgG and IgA HLC ratios individually to predict the relative risk of progression. 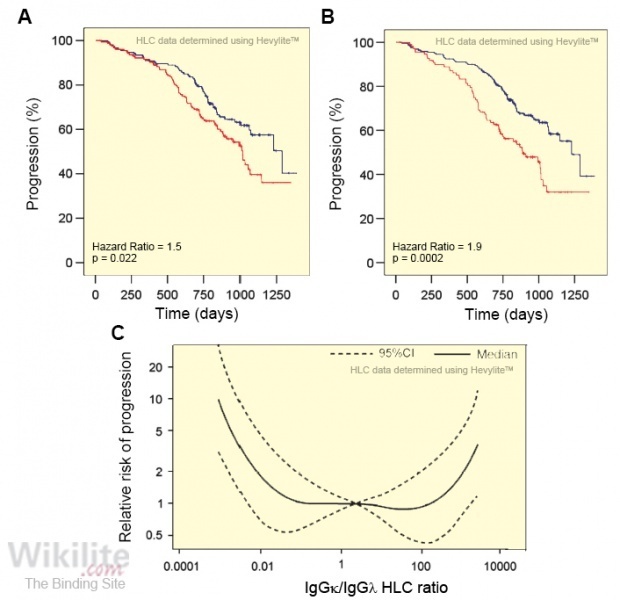 Increasingly abnormal IgG HLC ratios were associated with an increased risk of progression (p<0.001; Figure 20.9C), but this did not apply to IgA HLC ratios (p=0.32). It is likely that the IgA HLC ratios would have been associated with poorer survival if more patients had been included. The contribution of baseline values of iHLC and uHLC to the risk of progression was also studied . When IgG and IgA patients were grouped together and categorised by tertiles of iHLC or uHLC concentrations, patients who had iHLC concentrations in the top tertile had significantly shorter PFS (HR 1.4, p=0.039; Figure 20.10A). However, suppressed concentrations of uHLC concentrations were even more significantly associated with shorter PFS (HR 1.8, p=0.002; Figure 20.10B). No significant association was observed between PFS and concentrations of the non-tumour immunoglobulin isotypes (i.e. classical immunoparesis). The revised international staging system (R-ISS) for MM features serum β2M and albumin, factors in the original International Staging System (ISS), along with lactate dehydrogenase and cytogenetic abnormalities (Section 20.1)  . The correlation between serum β2M and albumin measurements and PFS is shown in Figure 20.10C (p=0.017) . In univariate analysis, extreme HLC ratios had a greater prognostic significance (p=0.017) than albumin (p=0.153) on PFS. Concordant with this, in multivariate analysis, elevated β2M (>3.5 mg/L) and extreme HLC ratios (<0.01 or >200) were the only independent variables to identify patients with reduced PFS, whereas other variables (albumin <35 g/L; κ/λ sFLC ratios, and cytogenetic abnormalities [Del:13, t4:14, Del:17p]) did not reach significance. A risk-stratification model was developed in which patients were grouped into three categories: low risk (β2M <3.5 mg/L and HLC ratio 0.01 - 200), intermediate risk (either β2M >3.5 mg/L or HLC ratio <0.01 or >200), or high risk (both β2M >3.5 mg/L and HLC ratio <0.01 or >200) (Figure 20.10D). In this model, the high risk group was more significantly associated with shorter PFS than ISS stage III disease (p=0.000002). The prognostic value of HLC pair suppression was also studied by Ludwig et al. in a study of 156 newly diagnosed IgG and IgA MM patients. Three categories of HLC pair suppression were defined: no suppression; moderate suppression (below the lower normal limit and up to 50% suppression), and severe suppression (a >50% reduction below the lower normal limit). Patients with severe HLC pair suppression had significantly shorter OS compared with patients in both other groups combined (median 45.4 vs. 71.9 months, HR: 1.616, p=0.019). Similar findings were observed in IgG and IgA MM by Garcia de Veas Silva et al. , and an initial study by Kraj et al. also confirmed the prognostic significance of HLC pair supression in the rare subgroup of patients with IgM MM. On multivariate analysis, Ludwig et al. reported that severe HLC pair suppression remained independently associated with survival when both IgG and IgA patients were considered together (HR: 2.553, p=0.013), and when IgG patients were studied separately (median 46.4 vs. 105.1 months, HR: 1.839, p=0.017). One explanation for the link between HLC pair suppression and early mortality was suggested by Garcia de Veas Silva et al., who found an associated between HLC pair suppression and the occurrence of bloodstream infections within 6 months of diagnosis. The authors conclude that their findings highlight the importance of recognising HLC pair suppression in newly diagnosed MM patients.